Casablanca Hotel Times Square – This Midtown hotel gets excellent reviews and often has rooms available for around $250 a night. Library Hotel – This boutique hotel in Midtown Manhattan is located on 41st Street, near Grand Central Terminal, the NY Public Library, and Bryant Park. Hotel Elysee – Boutique hotel in Midtown East, on East 54th Street, between Park Avenue and Madison Avenue. Close to shopping and the southern entrance to Central Park. The Bryant Park Hotel – Located right next to Bryant Park and close to Times Square and other attractions. 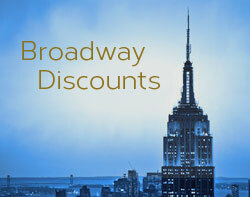 Archer Hotel – Well-rated Midtown Manhattan boutique hotel. Rooftop bar has nice view of the Empire State Building. Citizen M New York Times Square – Modern hotel with a Times Square location. Small but reasonably affordable rooms. Staybridge Suites Times Square – Studio suites have a small kitchen area with stove, toaster, microwave, and refrigerator. Complimentary breakfast and wi-fi. Yotel New York at Times Square West – Stylish hotel with a modern design and large terrace where meals and cocktails are served. Rooms often available for under $200 a night. Hyatt Centric Times Square – Spacious rooms (by NYC standards) with floor-to-ceiling windows, providing excellent city views. The French Quarters Guest Apartments – Located in Hell’s Kitchen, on 46th Street between 8th and 9th Avenues. The colored lines on the map are subway lines. Finding a good deal on a hotel in New York City isn’t easy. First, you have to re-define what at “good deal” means, because NYC hotel rates are going to be higher than most other places in the country. Second, you need to be sure that the hotel is comfortable, well-maintained, and in a decent neighborhood. One of the best ways to figure all this out is by using one of the hotel price comparison sites. TripAdvisor is a good one because it includes traveler reviews and even lets travelers upload photos, plus, they show available rates from the major hotel reservations sites, so you get reviews and price comparisons all in one place. The hotels listed above are 10 relatively affordable hotels that are top-ranked at TripAdvisor. Most of these have rates in the $250 – $320 range, although some may be a little higher or lower, and all rates may be higher during peak travel seasons. You may find much lower rates during the coldest months of winter and the hottest months of summer. 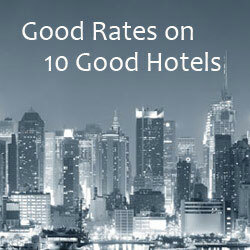 Basically, NYC hotel rates vary greatly, even for different dates on the same hotel. Be sure to shop around. Many Manhattan hotel rates are well over $400 a night. Some are much, much more than that. Rates vary by season and even by day of the week, so try being a little flexible with your travel plans to get the best deal. The best rates are often on the weekend, particularly Sundays. Be sure to check our hotel deals section before you make your reservations. Sometimes you’ll find promo codes that can save you a little extra money.